Action Type: Command Command: /usr/local/nagios/libexec/security_audit_completed.sh "%host%" Action Text: Security Audit Successful! Action Text: Security Audit Successful! Apply the settings and browse to any of your host’s details pages. Click the “Security Audit Successful” link and voila!, you should see a new comment after a moment or two declaring that the security audit was indeed successful. All the portions of the component are explained in detail in the documentation. This example, among a few others can be found therein as well. The one issue with this component was the lack of documentation, and with all of the potential uses and options, a small tutorial was necessary. 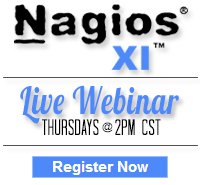 The following document below walks though the basic options, explains the complex ones, and offers up a few use cases including adding comments from the link, writing to the command pipe and even emailing a ticketing system – all from hyperlinks on the details page of any Nagios object!